By definition, inflammation is the “reaction of a tissue to injury or infection, characterized by heat, redness, swelling and pain”. This reaction is a necessary process for our body to heal and recover. Each day we expose the body to perturbations that can elicit an inflammatory response. One relatable scenario would be our training sessions. When we exercise, we are breaking down tissue, stressing multiple systems of our body (muscular, cardiovascular, pulmonary, hormonal, arterial, just to name a few), and even producing oxidative stress with the goal of recovering from that session enabling us to complete more work and lift more weight in the future. The key with all things related to the body is balance, also known as homeostasis: “the body’s ability to maintain a stable and constant internal condition”. This is where management of how much inflammation we create and how much we can heal from is crucial. Most people are unaware of how many aspects of their lives can cause increases in unwanted inflammation. Stress and inflammation go hand in hand. We need both to thrive, grow, and repair but we must keep this managed otherwise we will tip into a chronic state of inflammation where issues begin to arise. An easy analogy I use with clients is to picture all of our stressors in a cup. Some common examples of stressors: training, lack of sleep, poor food quality, poor digestion, emotional stress, dehydration, work related stress, relationship stress, the list goes on. All of these stressors go into our “stress cup.” When that cup begins to overflow our bodies will transition towards a survival state, and eventually a burnout state, preventing us from thriving and growing. However, we can mitigate these negative side effects of chronic inflammation by learning what to look for in our daily lives. Below, we will discuss the pros and cons of inflammation, what to monitor to help manage our inflammation, and actionable steps we can take to counteract chronic inflammation. The opening paragraph definitely put inflammation in a negative light, but there are a multitude of reasons why we need it to thrive and grow. Whenever we cause stress or damage to the body, we activate specific aspects of our immune system to start the healing process. One fascinating tool our body uses are called Eicosanoids. These are signaling molecules that help regulate processes such as immunity and inflammation. The amount of Omega-3 and Omega-6 fatty acids we consume in our diet can affect Eicosanoid production. While the Omega-6 fatty acid functions sound “unhealthy” we need them. Without these “pro-inflammatory” responses, we wouldn’t be able to heal from injuries and recover from training sessions. 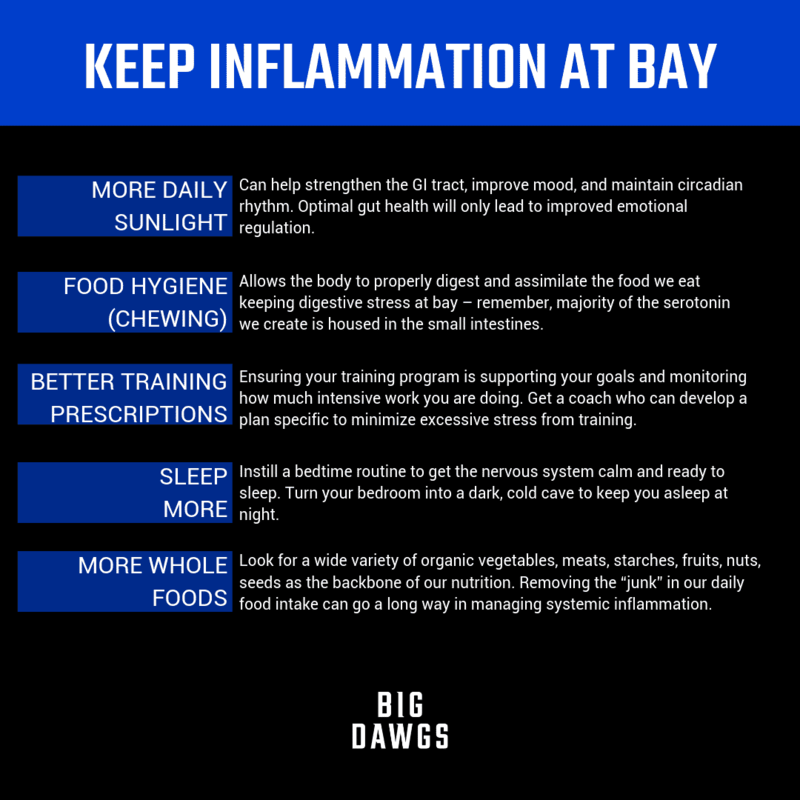 Inflammation is something we want to manage and ensure operates appropriately. It is integral to healing our body whenever damage has been done. It is our natural ambulance via our immune system. Too much of anything can become an issue. Inflammation is no different. This again touches on the point mentioned above regarding “homeostasis.” Our body is constantly ebb and flowing between states aiming to maintain homeostasis. While there are positive benefits to inflammation for healing and repairing, chronic inflammation can prevent our body from being able to grow, build, and fight disease. Constant stress can keep cortisol (our main stress hormone) chronically elevated. When cortisol is chronically (this is key as there is a difference between acute and chronic) our body will decrease thyroid function, altering liver function whereby preventing the conversion of inactive T4 (thyroid hormone) into active T3 (thyroid hormone), causing a build up of inactive T4 and suppressing the thyroid gland. As a result, if the thyroid is suppressed our ability to hold body temperature will be inhibited and energy will be preferential to the vital organs. This will also negatively impact our body’s ability to maintain proper blood sugar pulling us further away from a parasympathetic state. The more we shift away from a proper balance of parasympathetic and sympathetic drive, managing cortisol, the more we inhibit the capacity of our body to repair and grow appropriately. Monitoring training – too much intensive work that is not sustainable or is inducing fatigued based outcomes can cause increases in lactate, tissue tension, and shorten ranges of motion as a by-product. Quality aerobic work rooted in sustainable pieces of work will facilitate proper fuel utilization, improved oxygen delivery to and from the muscles, and limit metabolic substrates that would otherwise cause the system to move towards more acidosis. Monitoring food – when moving through phases of more challenging training, the body is in a fragile state due to the extra stress being imposed on it. Increases in foods that don’t sit well with you or might be a bit more processed can cause an unnecessary rise in systemic inflammation, more notably G.I. inflammation. Great food hygiene can help mitigate the risk of causing G.I. inflammation. Poor chewing can lead to the opening of intercellular tight junctions (increasing intestinal permeability) allowing passage of microbes and foreign antigens into the mucosa and the body proper. This can lead to an activation of the immune system and an increased secretion of inflammatory markers. Monitoring stress – The silent killer for everyone, stress. Arguably, the biggest culprit being emotional stress. When our mind perceives more emotional and environmental tension, amongst others, we transition into a heightened state where a stress response is initiated. A great parallel for this could be a group of zebra’s who see some rummaging in the brush and assume it could be a lion. They will instantly transition their state of mind and physiology to support the necessity to evade death. Our bodies work in the same way even though we don’t have to run from lions, thankfully. When we head to the gym or work and notice a particular person there that causes a lot of tension for us to be around, our internal systems begin to change, reflecting that tension. Some questions you can ask yourself to see how much emotional stress you might have, 1) how supportive is the environment I train, and / or work, in? 2) do I surround myself with like-minded individuals who pull me forward towards my goals? 3) do I have a supportive job and co-workers that raise me up and challenge me to grow in productive ways? All of these answers can give insight into how much subliminal stress we have in our lives. If most of your answers for these questions were not in a positive light, you could be inhibiting a wealth of growth and fulfillment in your life right now. Take some time to identify those pieces that might be causing insidious rises in inflammation. Let’s hit the main points that will go a long way in keeping inflammation at bay. As with all things, we are each unique and will require unique prescriptions. Use these as guidelines to figure out which ones have the biggest impact on your current situation. Better training prescriptions – Ensuring your training program is supporting your goals and monitoring how much intensive work you are doing. In addition to emotional stress, excessive stress from training can be another silent killer that people forget about. Get a coach who can develop a plan specific to your goals. Sleep, MORE – one of the best tools we can use to fix all aspects of our lives is more quality sleep. Instill a great wind down before bed to get the nervous system calm and ready to sleep. Turn your bedroom into a dark cave to keep you asleep at night. More whole foods, less processed foods- The less processed foods we can intake on a daily basis the better. Look for great selections of organic vegetables, meats, starches, fruits, nuts, seeds as the backbone of our nutrition. As with all things, this will be individualized but removing the “junk” in our daily food intake can go a long way in managing systemic inflammation. Let’s wrap this up. Inflammation is a powerful tool that allows us to heal and repair. However, we need to monitor the inflammation we impose upon ourselves daily otherwise we can fall victim to a state of chronic inflammation. This can lead us into a downward spiral of our internal systems inhibiting growth and favorable adaptation. A few key pieces we can adjust and monitor are our training, food intake and quality, and daily stress. In addition to monitoring, tools we can proactively utilize to counteract inflammation come back to the basics: daily sunlight, great food hygiene, quality training prescriptions, honoring sleep and circadian rhythm, quality nourishment via more whole foods. Start paying attention to the little things before they start to manifest into something that runs out of control.